Disclosure: we received a complimentary meal for three in return for an honest review. Read it here. Across the UK there are 81 Bill’s Restaurants. Our nearest one is in Durham City in County Durham and we were invited along to try out the new vegan & vegetarian menu. So one Sunday lunchtime me and the boys headed to Bill’s in Durham for a feast. Bill’s serves breakfast, lunch and dinner. Daily Dinner Specials, seasonal Set Menus and lots of favourite dishes and classics, as well as a Children’s menu. 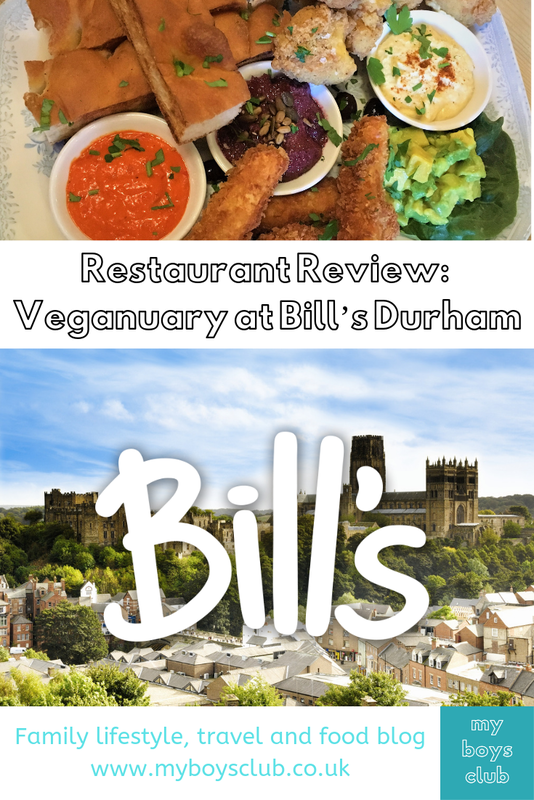 Bill’s is located on Saddler Street in the historic city of Durham, on the road that leads up to the World Heritage Site of Durham Cathedral & Castle. It offers casual or informal style dining with table service and I really liked the recipes on chalkboards on the walls and the motto "Good things come to those with plates". Bill Bryson called it ‘a perfect little city’. It is a captivating city with winding cobbled streets and a prominent peninsula crowned with the dramatic Durham Cathedral and Castle World Heritage Site – one of the most stunning city panoramas in Europe and now home to Open Treasure, the Cathedral’s world-class exhibition experience. It is a quintessential old English University City, with relaxing riverside walks and river cruises as well as offering superb cafés, artisan workshops, boutiques, galleries and museums. Just 10 minutes on the train from Newcastle or a 20 mile drive its also a great place for a family day out. We drove and parked in the Prince Bishop's car park which was less than a 5-minute walk from the restaurant on Saddler Street. This month it has introduced several new vegan specials to celebrate Veganuary, as well as its existing vegan favourites including the Bill's Wellington made with carrot, mushroom and cashew nuts which means the restaurant chain has plenty of plant-based options on the menu. The new Vegan Set Menu is served Monday - Friday from midday until 7pm and is not just for Veganuary it will be available until at least 25 February. I spoke to the managers and they told me that the Veganuary menu has proved very popular and not just with vegans and vegetarians, but with all customers, and meat-free food will continue to be a focus throughout 2019. And it’s not just vegan food that Bill’s is embracing. They are also aiming to be as eco-friendly as possible by replacing plastic straws with a biodegradable alternative; only dealing with suppliers that can provide whole eggs that are from hens that are happy, healthy and free to roam; reducing our salt, sugar and fat; using 1005 biodegradable takeaway coffee cups; recycling, saving paper and energy; and supporting ‘Refill’ - an app that allows you to find local businesses that will happily refill water bottles, therefore encouraging a shift away from buying plastic water bottles. There are breakfast, lunch and dinner menus plus set menus and a children’s menu which was tempting but the boys decided they wanted to order from the main menu – however, the portion sizes are big so next time I think they may stick to the children’s menu. There is an extensive drinks menu from which we chose Fentimans Ginger Beer, a Lemonade and I had warm elderflower cordial – a really refreshing and warming drink for a cold and wet day in Durham. We decided to share the Veggie Sharing Plate V 11.95 This comes with crumbed halloumi sticks, crispy fried cauliflower, niçoise olives, toasted focaccia, smashed avocado, hummus, purple basil & pine nut pesto, red pepper tapenade and mixed seeds. It was delicious and went down surprisingly well with the boys – especially the focaccia, red pepper tapenade and the cauliflower. Then for mains. As it was a Sunday I decided on the vegan Wellington as it was pretty close to a Sunday Dinner dish. Bill’s Wellington VE | N 11.75 This is a carrot, cashew nut & mushroom Wellington with butterbean mash, long stem broccoli and rich vegetable gravy. It was beautifully presented and tasted as good as it looked. Also, very filling. My 9 year old veggie tasted it and liked it. The boys opted for Macaroni Cheese V 10.25 and Buttermilk Chicken Burger 12.95. The macaroni cheese was served with a green leaf mixed seed salad and toasted focaccia. My youngest is quite picky with his food but really enjoyed this dish. After enjoying a veggie starter my eldest opted for a chicken burger for his main. This was crumbed chicken breast, with creamy coleslaw, chipotle mayonnaise, sesame bun and fries. He struggled to finish it but did enjoy it but not so much the coleslaw as he’s not a big fan but I am and it was really tasty. I have no idea how they managed to eat dessert, I struggled to finish my meal with a skinny latte, but they opted for Bill’s Ice Creams and Sorbet V 4.95. Vanilla and the vegan coconut ice-cream and lemon sorbet. All refreshing and tasty and probably a really good way for them to end the meal. We received our meal complimentary but if we had paid it would have cost approx. £65. A Children’s menu is also available for £6.96 for three courses plus a drink, which would make the meal for 3 people just over £40. 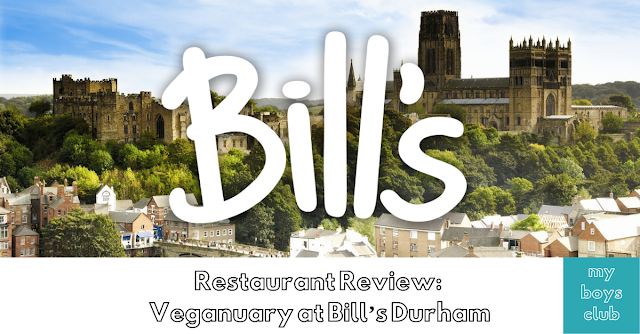 The food was delicious, the service friendly yet efficient and still welcoming, and it made for a very enjoyable family meal out in Durham. With an InDurham Loyalty Card from Durham BID, you can also save 20% on food at Bill's as well as at many other places in Durham City. The InDurham Loyalty Card costs £5 for 12 months’ worth of discounts (T&Cs apply).